I typically get into the Summer Olympics, but this year, I’ve found myself watching sports I’ve never given a second thought to like rugby and judo. The ongoing competitive atmosphere has kept me and my fam on the edge of our seats while we cheer and feast on carbs like they’re going out of style! 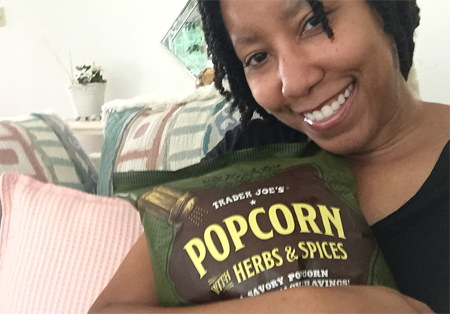 Speaking of carbs, you haven’t lived until you’ve O.D.’d on Trader Joe’s Herbs and Spices Popcorn. 🙂 I’m sure I could eat 5 giant bags of this stuff in one sitting. Easily. Let’s have a candid convo about your traffic building experience thus far — especially those of you who have started your site in the last year or so. Have you noticed there are more posts on traffic building than any other topic on Internet marketing (That includes SEO, social media, etc. ), yet it is an ongoing challenge for many people? Do you see any irony in that? You will be flooded with oodles of content about how to drive thousands of visits to your site with Google, blogging and social media. So if the information is all right there – just a quick Google search away – why isn’t building traffic more straightforward? Why aren’t you growing your traffic by thousands of visits every single month after reading these articles? Have you not taken the time to try these strategies? Are you overwhelmed with where to start? Not having much success with what you’ve tried? These tips are completely bogus! Yep… That must be it. Only kidding. 🙂 Of course, that’s not it either. In this podcast, I discuss why I believe there is often a disconnect between the amount of info available and the results for a lot of you. I’ll also reveal how the evolution of Internet Marketing really encouraged the direction and topic of the new site. I had to realize where I can be most helpful due to how things have changed. This is a very short podcast (under 14 minutes), but jam packed with some candid comments. Hi Lisa. I designed my website Mashables.in using wordpress. i am a newbie to blogging, my blog is not getting enuf traffic ..how can i increase my traffic..Please advice. Thank you. Number #1 rule is to just create good content. I would not care about the rest that much. Hi @Lisa, let me ask one quick question, what if I use viral contact on my blog, like viral stories, news etc, then is there any formal way to get a bunch of referring traffic? means can i make those new visitors to my loyal readers? Hi Lisa. I designed my website using wordpress. As a newbie, I browse and read lots of articles especially about SEO and theme customization. From many of articles, I find your tips here are easier to understand. Please advice. Thank you. That’s true, but I bet many people could argue that they have been patient and have quality content and still no one visits. So today you still have to be proactive to put yourself out there. With 90 million new pieces of content added to the web daily, you have to market yourself too. But yes, quality content is certainly the first step. I’d also add creativity and determination. I agree with you Richard. Great content and patience is the key and the number one factor to getting traffic to your site. So instead of waiting patiently for the traffic to come to you. Take yourself to where the traffic is, and watch your site get flooded with traffic. Thanks for sharing Lisa, you are great. I just created a new site and i’m confused where’s the right place for me to get my first visitor. And then i just started to create a thread on a forum that’s related to my niche. It’s work for a day or two, then the traffic dissapear. That’s very normal for forum traffic because the thread eventually drops down off the radar. What about social media or YouTube? Even Though There are are way too many Sites giving same tips on How to increase traffiic, still a new blogger should read each of them and try to implement every idea with patience. Yes. You said 2 very important words here: try and patience. I agree. My name is Anthony Eanes, I’ve been a fan and viewer of your website since site build it “site sell” days. I know I haven’t been active on your “website” and now your blog, but I have shared numerous of your videos and blog post over the years. I made a purchase through one of your affiliate links for site sell to create my website a long time ago. I can remember watching your tutorial videos on subjects like Dreamweaver and Ftp. We both came on the internet around the same time in 2002. I agreed when you said that practical is the way to go. You can teach someone strategies on how to set up YouTube, Facebook, Pinterest, or Twitter but it’s up to them to figure out how to use these platforms to master getting traffic to their website. Internet Marketing is not one size fits all because I can show people how I received 10,000 visitors from YouTube but I can’t guarantee that this will happen to them. I want people to take what I did and customize it to fit their lifestyle. Just like you said I might be funnier than most people, more handsome, or even race has played a significant role in traffic. They are numerous variables to building a community online. Currently, I am a full-time student at the Full Sail University for internet marketing. I’m going to school for this to get more education, credibility, and to be a well-rounded internet marketer. A few months ago I wrote a paper on you about the internet marketers who inspired me the most. I emailed you last year about it, but I didn’t get a response from you. I didn’t sweat it because I knew you were busy. So if you have a backlink from my University then you know it was from me. So over the years I have been writing blog post, backlinking, helping managing ads such as FaceBook, and Ad Roll for clients. I have been working for a guy by the name of Jason Dorhn. He came in around the same time we did Lisa. I didn’t even know that we were from the same city. Jason has worked with some of the biggest names in the internet marketing industry. He doesn’t focus on SEO such as backlinking to receive traffic. Jason concentrates on paid traffic which involves setting up a sales funnel to capture his leads. He has a landing page that converts 54% of the time. Mainly he uses Ad Roll or FaceBook ads, and he gets like 30 cents per leads by these two networks. Jason and I tried everything you can think of to make money online and to gain traffic. The best way to make a good living online is to have your own product or service. I am in the process of creating a music service for artists pretty soon. Jason, on the other hand, is making a healthy living right now. His website is http://jasondrohn.com and sells software to help veterans or newbies grow their business. He also provides done-for-you marketing services and material to his clients, using proven and time-tested strategies! He even has done-for-you service http://www.doneforyou.io/what-we-do/. So if you want everything done for you, his services are great no matter if you are a professional or newbie. Thank you for the great content over the years. Lisa I will continue to support you no matter what you do. Oh! I almost forgot that you had inspired my girlfriend to become a Youtuber. I showed her your napturallycurly.com website, and she loves your content. It’s going on like three years since she had a perm and the transition was rough with her, but she did it. I am proud of her, and here is her first YouTube video for a protective hairstyle https://www.youtube.com/watch?v=IlnGZvIMKwA. We just had another baby we are in the process of setting up her niche website soon. God bless you, Lisa! I am new to blogging and yes faced with same challenge to build traffic to my blog. 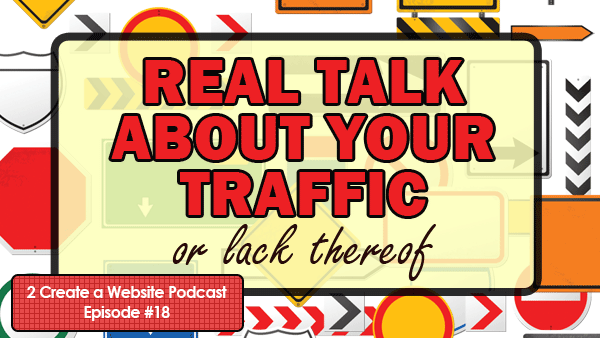 There are tons of results as to how to build traffic but nothing seems to work properly. Building traffic is a process that requires so much more than it ever has thanks to the sheer amount of content being generated today. I want the step-by-step, but it’s just next to impossible due to shear number of changes happening almost daily to the web. Combine that with the fact that most businesses do not have a relevant message and they are in a traffic deficit before they ever begin. And, traffic does not equal says. Get that right and one has a chance at achieving their strategy goals… but strategy goals should aways be dictated by the message that is for one person, with one problem / need / want / desire with one solution. As always, I love your integrity and honesty. PS – I took about a six-week break from blogging, podcasting, video, commenting, etc… I’m refreshed and I’m launching a new webinar next week a new online course. Chat soon Lisa. I hope you’re doing well!!!! Here’s my take on the whole traffic generating ordeal… I think that people that are new to the building traffic idea, are a bit misinformed on exactly how traffic building works. And to sum traffic building up, would be to say that it takes time to build an audience… period. It doesn’t matter if you’re on facebook, pinterest, tumblr and every other social network that pops up, you are still going to have to give a little growing space and not rush everything. Me myself, I’m in no hurry. I wrote some of my articles / blog posts over a year ago but didn’t even launch my site until a little over a month ago. I’m just testing and learning really, but at the same time I’m in no hurry. I will admit that this is not my first time around the block, so I pretty much know what I’m doing but I’m also aware of the shortcomings to come. While I now know how to build sites and market them, I still take my time in doing so. For instance, I have a main site that I’ve now decided to focus on, but I’ve had the site for over 7 years now and did absolutely nothing with it until now. I know, that was crazy on my part but now I’m in it for the long run, and that’s where it counts. You have a nice day, and keep bringing great inspiration to us all. You left me a bit confused after reading your reaction. Your main website exists for more than 7 years, yet you haven’t done anything with it? So you paid for hosting for 7 years but got no income whatsoever on that specific site? This site is something your passionate about then I’m guessing and it would hurt you to leave it? I’m really enjoying most of the articles you have written. I want your help. I have authored a new blog for movies, Google is not sending any traffic. I was just talking with someone else today about how I started blogging in ’03 on Xanga…and never would’ve seen the BEAST that is social media coming! haha Definitely a struggle for me…And I liked what you said about teaching something practical. I just don’t know what I could teach! Seriously, I know everyone says “you know more about something than someone else does” or whatever, but I can’t seem to think of anything I could teach/help people with. I’ll probably never give up, though 🙂 Thanks Lisa! A BEAST is the right word indeed! As far as thinking about what to teach, think about your personal life. Do you find yourself giving advice about the same topic to friends and family? That’s a great place to start. Sometimes we take what we know for granted and don’t realize there is value to others who don’t even know as much as you do. Glad you aren’t giving up! I love marketers like Pat Flynn, Amy Porterfield and Derek Halpern. All world class marketers with TONS of freely available how-to info along with their high-priced stuff. But I REALLY love you, Lisa! Not in janky way, of course. More like APPRECIATION for what you do and the down to earth way you do it. I know I heaped lots of praise on you from time to time. No worries, I know you’re human just like the rest of us. Like most budding online marketers, I’m on EVERYBODY’S list. Pat Flyn, Steve Scott, Amy, Derek, et al, et al. Even Jim Edwards. As much as I value the nuggets of marketing advice they provide, their emails get sent to a folder called The Tank. To read later. If I feel like it. Or delete. But YOUR emails get sent to my INBOX and get READ! Why? Because you always deliver valuable or worthwhile content. As for Episode 18, another good episode. Love the humor and straightforwardness. My niche is southern California hiking trails. It’s a tough niche due to limited demand and lots of competition. I have noticed a slight uptick in traffic, however, on posts that I revised using Yoast’s fairly new READABILITY function. Even if it hasn’t increased traffic, it has definitely improved my writing. I am systematically replacing long sentences with 20 words or less sentences. And adding subheadings for paragraphs longer than 300 words. It’s a little work, but if nothing else, it cleans up the content. Anyway, that’s my two cents. Cheers! Aw James, you’re gonna make me blush! LOL It’s an honor to even be in the same SENTENCE as those people so thank you for saying that. I wish you all the best with your site. I was actually in California this year for my birthday and some friends and I went hiking up Pfieffer Falls. Oh boy. That’s when I realized I am NOT in shape. LOL But it was fun. Howdy Lisa, good to hear you had some fun at Pfieffer Falls. Haven’t made it up there yet, but now I’m going to have to check it out if I get to the Big Sur area. As for Amy Porterfield and Pat Flynn, I agree that these guys are definitely great marketers with tons of outstanding content. Love their podcasts and blogs. Anyway, happy marketing to you! wonderful podcast 18 i just felt that it was created the people like me. world. i have decided to change my niche from just chose a niche that i can’t build more contents to i am passionate about. i thank you to give the boost like this. i hope to get podcast like this in future. Yep! I can’t imagine having a website today on something that I have very little interest in. I’ve tried that and it was NOT fun. It felt like a chore to update the site. A few years back, I’ve launched my very first website after reading your stuff and watching your youtube video channel. Of all people on earth, you were the one that convinced me of ‘just giving it a try’. I’ve been on website babble from time to time to learn more from you and your friends. So I would like to say: thank you for that. I’m sorry for the future of website babble. It was a great community without a doubt. This is very encouraging podcast i heard today, You make me believe that without coming out of our comfort zone its nearly impossible to get traffic. If we need to get more traffic we have to stretch ourself and try all the ways to know what work for us!! What is your opinion of affiliate marketing? I understand that takes constant work (like social media marketing) – but it that something you have personally ever tried. Thanks for all your enthusiasm and good work. I can tell that you are very loved by all your followers. I had to smile at this one. I have a tad bit of experience. Thank you for the links Lisa. I watched your video and if I decide to put up some affiliate links on my website, I will buy your course. Good information is always worth paying for. Have I learned that lesson before! My original question was more about setting up an affiliate program from my own real estate products – however you opened my mind to possibly selling other people’s real estate products that have affiliate programs. Hmmm – there are always so many possibilities but so little time. Ahhhh I see. Sorry I misinterpreted the question. There are 3rd parties out there like ShareASale that will run one for you. For my new site, the plugin I’m using to sell courses is designed to sync with iDev so I can run my own affiliate program pretty easily in house. Just listened to your Podcast which I have to say, for the length of it, it packs a punch … a good punch! Like some of those that have commented before me, I’ve had my site on-line for just over 2 years. I am selling a product that is in a very competitive market – kids wall art. So, got the website up, joined etsy, listed on ebay, got on pinterest, am on facebook, signed up to a course ‘turn your etsy shop into a money making machine’, subscribed to various SEO groups, subcribed to various other on-line marketing stuff, tweaked and tweaked my SEO to many times, tweaked and tweaked my images, but guess what?? Not one sale on my website. OK, had a few on etsy and ebay, but nothing compared to some of my competitors. My husband says the market I’m in is too saturated and he may be right, (oh just remembered am on Mamadoo.com.au as well and have been approached recently by VIDA). There have been countless times where I’ve thrown my head in my hands and asked myself, why do I keep going??? The simple answer is, I love what I do! So I don’t want to give up. And I am very lucky to be a stay at home mum which allows me to do this. What you said in your podcast about one package fits all is unrealistic lit a lightbulb in me. I’m not quite sure how or where that lightbulb might take me, but one idea is to try and add some value to the website in relation to my prints but not about buying them. Yes, it is hard to get out of your comfort zone. Yes, it is hard to continue to try and be creative. But with people such as yourself who provides us with such valuable information is what keeps us going. Thanks Lisa and thanks to everyone on here as well. First of all, I love you guys for taking time to comment. Hearing details about your stories and struggles is so valuable so I know exactly what you need and want so thank you for honoring my requests to comment. I genuinely love reading about you all. Saturation is an issue for almost any market so I’m glad you are not ready to throw in the towel. If you were in a market that wasn’t saturated then I’d question the popularity of the niche and if it’s worth your time. So every place that is worth diving into is somewhat saturated, the key is how are you going to stand out, as you said. Do you follow the social media accounts of the people who are doing really well in your niche? Sometimes if you take what they’re doing and switch it up a bit can help you get ideas for what’s working. And I’m so glad this podcast is motivating people. I really hoped it wouldn’t come across as negative to people who are struggling, but I just wanted to keep it real. Glad that message is coming across. This podcast was spot on for some many reasons. My biggest take away was about teaching something actionable and practical. I have courses that teach about making money online but it doesn’t work for everyone. And that’s just the reality. It’s very similar with traffic courses. So I definitely want to move towards things that provide a more definite result. So it probably won’t be in my make money niche. I just keep thinking about your Photoshop course. I felt like I got my money’s worth with skill sets that I can and have already applied. That is winning recipe for selling anything. I also agree that there are no guarantees when you start a business online. Too many people approach it like it’s a job where your hours guarantee you a certain pay. It doesn’t and you need to be comfortable with that risk. And you also have to be comfortable with failing and trying again. I hope everyone really took this podcast to heart because you dropped some gems. Look forward to your next site and course. Eddie, that means a lot. I listened to this again several times after recording it and I hoped it would come across the right way. I rambled a bit and it was kind of all over the place, but I’m so glad the message came through. And yes, that’s what I want people to say. You cannot look at business and trade dollars for hours and that goes for online OR offline. It’s funny how when someone starts a business offline they rarely say “How long before I make $X? ?” No, they realize it’s about how many people come into their store, marketing, etc. Well, guess what folks? The same thing applies online! Appreciate your support and kind comments about my Photoshop course. I really enjoyed teaching that and it’s so cool to see how many people who always thought it was tricky to learn are comfy with it now after the course. That is such a great feeling as a course creator. Thanks again. Nah, don’t ever worry about coming off the wrong way. I keep it brutally honest with people on certain subjects knowing it may may make some people uncomfortable. But sometimes we all need real talk. And I’ve learned that most people appreciate that over BS. We all know your message is meant to make us better. I’m sure you’ll relate to it. that have my sites listed … but i need to make more videos. they never sell much but the advertising is good…i’m also on Etsy. I think having too much going on could indeed be a problem. I have a niche site that gets about 500 visits per day and it is earning because the content is very focused. So I bet you if you narrow down and focus on a single topic then that will certainly help! Thank you so much Lisa for this podcast. I believe this is some of the most valuable information I’ve heard all year. I agree with you about fear and comfort zone. I believe this has been my issue. Today I will take a real look at my strengths and what I can do to get traffic to my site. You’ve lit a fire under me. Thanks so much for being you. Best wishes for your future endeavors. I found your podcast to be very thought provoking because it was direct & honest. Theory alone will never lead to any kind of real success but practical application does. My experience with traffic is that I am overwhelmed with where to start and my results are none existent so maybe you have tips on a good starting point for beginners? Kim George left a great comment below about social media and being consistent with it. I think the hardest part about social is that it takes time to build traction. It’s a combination of connecting with people in your niche by engaging in their posts. And you also have to post regularly… and I mean several times per day. But it’s good there are scheduling apps like Hootsuite, Tweetdeck, etc. I always tell beginners to pick ONE platform and focus on that. Don’t try to be popular everywhere when you are first starting. Please hang in there! I know it can be overwhelming. Thanks Lisa for the encouragement! I will take Kim’s advice and stay consistent and keep at it regarding social media & I will take your advice on picking one platform and focusing on that. I will let you know how it all goes. Listening to your podcast gave me with another idea. I’m a crafty creator type. (One doesn’t have to be I suppose) in order to do this. In my case since I am always using products or art supplies in my videos and what not. I thought why not share my creative video link or whatever I’ve done with (xwyz’s) product, with the owners of the company/ brand’s social media accounts? I say something like; ‘Hey, look what I have created with your markers”. Along provide the link to my creation. I should probably go do that right now, in fact. haha! Lisa, you sure did talk up that foodie blogger. With all that good stuff you mentioned I’m going to have to check out her and her blog! AND I know if you mention someone or something, it’s genuine! I shop Trader Joe’s too! Now did you get any juice for promoting that? Maybe you should share a link on their social media account. Just sayen..
Let me tell you, this WORKS. I tagged AWeber in a tweet once and it got the attention of their affiliate manager and they are working on a custom affiliate landing page as we speak. I’ve had a similar thing happen before with Powtoon too. I think this can work but it doesn’t always because no doubt this strategy is used over and over again and people can’t share or respond to everyone that tags them. BUT if your content gets their attention and is exceptionally good they will take notice. That’s the key. There is definitely a fine line though. I’ve seen people abuse the mentions and you just end up getting ignored if you do it too much. The bottom line is your content needs to be newsworthy and well done. Sometimes I feel for the really popular people because I’ve seen people tag them in hopes they will share their post. They probably become immune to it after a while and ignore it — especially in the Internet Marketing space. But this may work better in other non Internet marketing spaces because there is less promo. But yes… It’s all about being creative. Indeed! I didn’t bother contacting Trader Joes. Now if the company’s followers are more relevant to my audience (like AWeber) then yes, I will do that. But I don’t usually bother with less relevant mentions. Great podcast, Lisa. It’s interesting you’re talking about the difference between practical and theoretical courses and programs. I’m creating a course about starting, running and growing an online business and I’m having trouble with the promo video because I’m saying: “There is no step-by-step formula to success online” but the sad thing is that’s what people want to hear. There are expensive programs out there that offer just this, and people buy them and don’t see any results. That’s about business in general and you asked about traffic. What’s working for me? Nothing! I’ve been blogging for 10 years and from the beginning onwards my traffic went up and up and up. Until the beginning of 2013 and since then it’s been going down and down and down. I’ve had “the best” SEO people look at it and no one can tell me why. I’ve concluded that Google just wants to give the traffic to the big brands. The days of small bloggers and small sites getting traffic because they create great and original content will be over shortly if this current situation continues. That’s not to say there aren’t opportunities out there. There are. But we have to use evermore creative ways to differentiate and present our great and original content. As you say, it’s more about video and live video now as well as trying different things. Again, great podcast. I love your style. I recently read or most likely watched somewhere that “Great Content” really isn’t a huge factor at all when getting traffic. In my observations of many niches I have found that to be very true. The one thing that I see most successful traffic getting people do is syndication over a broad range (with special emphasis on 1 or 2 spaces) of platforms. When I say syndication I’m not referring to software automated spammy stuff. An example is Gary Vaynerchuk who is a practitioner on several platforms but in particular Facebook, YouTube and Snapchat. Lisa has her YouTube and Blog (and I’m sure several others) so we could say it applies here as well. I myself am active on Google via SEO and the next thing is probably Facebook although I do have a finger most other platforms just not to the same degree was the former 2. As I’ve mentioned in my post here you really do need to be constant like a river lest you become stagnant and irrelevant (a metaphor for if you don’t stay on task something will change and you’ll be left behind). I think that this is where the online mantra of doing what you love even if you weren’t getting paid because not only relevant but pivotal. Just my 2 cents… I hope it helps. This is true, Eden. If you think about it, popular people generally dominate 1-2 platforms (sometimes 3 or more) but it’s usually a small number they focus on. I think newbies try to take on too much and try to be everywhere like the people they admire but you have to start somewhere. As they say, “Rome wasn’t built in a day!” lol Great points. You are too kind, my friend. Thank you. Yes, I’ve pretty much stopped caring about SEO. Google made up their minds that they want to promote brands. Glen of Viper Chill candidly wrote that we only have about 2 years left of being able to get any worthwhile Google traffic unless you’re a big brand. But the good thing for you is you have a load of practical design and software skills, and I think that’s why you’ve done so well on Udemy. So at least you can always continue to teach those things too. Speaking of Udemy, just heard the news of the prices changing…. AGAIN. I knew they’d loosen the reigns a bit after a few months. Yeah, I was sort of quoting Glen of ViperChill when I said that. I also thought his recent post on Google only returning websites from 15 big companies in the search results for high paying keywords was particularly telling. I’ve found that anytime I don’t concentrate on short term success I’ve succeeded. I have learnt SEO over the last few years and now realise that you can do incremental improvements. The other thing is that I noticed is that you need to constantly (not necessarily heavily) be doing whatever your strength is. For example when I stopped SEOing some of my sites for 6-9 months they inevitably lost rank. I also thing that having 2-3 ranking strategies is important. While SEO is my thing I’ll do video and the odd FB campaign to stay in touch with whats going on. For me I’ve found having contactable mentors is HUGE. I’m part of a membership SEO group called Ranking Rabbit (http://www.rankingrabbit.com). The best part of this group is the private FB group where everything from simple to extremely complex questions get answered. I totally agree that you should have a mentor or at the very least someone to model in your chosen field. It’s absolutely critical to success. I’m so enjoying these comments. You’re the 2nd person to mention consistency. I think that’s where many fall short today. You cannot try something for 2 months and say “It doesn’t work.” It might take 6 before you have a breakthrough. Soooo I am totally loving this podcast Lisa…especially your emphasis on using Social Media for branding and building a community. Im learning more and more that yes you want to focus on getting traffic to your website or blog..but that you really need to focus on getting the right kind of traffic and visibility andddd from different sources outside of Google. Gone are the days of relying on one traffic source for getting exposure for your brand…and if you ask me its pretty risky to do that. For instance I hear peeps talk about using Facebook as a primary traffic source. My question to them is what if Facebook decides to disable your page…or ur account? Then what will you do? Which takes me to my next point: Now more than ever I think its smarter to really focus on building a STRONG brand and a community that supports that brand. If you can get peeps to fall in love with your brand …and what you have to offer… then youve really got something there. These will be the folks that will rally behind u, share your content, promote your content and more! This is essential if u want to make an impact online. To Kenneth…I feel your pain bud but as Lisa stated dont give up. Youve got to get out there and try something new. Try using social media networks more. I can tell you first hand that social media Works if you are consistent with it. Okay im off the soapbox. Love this candid podcast Lisa. Looking forward to hearing more ? It really is about building a COMMUNITY of people who trust you. And just like you and I talked about before, it doesn’t necessarily have to be big community. When the message, audience and price is right, you don’t even really need as large of a following as people assume. I’ve been doing some offline consulting here and there (when time allows) and one thing I’ve learned is that people will pay a premium price if you have what they want. People who trust you and value your info will pay big time. And it’s a win-win. You get paid well for the work you do, your customer is happy to get your personal advice, and you realize you don’t really need a HUGE following when your message and audience aligns. I cannot wait to implement this the RIGHT way on the new site. Consistency is sooooo key. And I think that’s where most get stuck. It’s natural to try something for 3 weeks and say “This isn’t working.” But you cannot do that…. especially with social media. Very well said, Kim and keep doing your thang! I know of a good one that gives a general run down of the different traffic methods available today and how to do them effectively. It includes a personal coach to hold students accountable and is very affordable, but it’s just information and doesn’t promise a one size fits all procedure. Similar to what you emphasised yourself, it’s not really fair to judge whether a course ‘works’ when it’s a mostly theory based rather than practical course. The information may be accurate but results will always vary. And that course you referenced sounds like a fair way to go about it. Actually with all the effort over the years that I have put into trying to get a Google rank or even noticed and with no such success I think its time to close the doors on trying to get anywhere online. You are the exact kind of person I want to hear from. Let’s talk about that. Since Google has changed the game, have you tried anything outside of Google? And if so, why not? Are you just more interested in being anonymous? I know that’s a lot of the reason people gravitate toward Google. I hate to hear people giving up.